Some of you may remember this post where I shared my love for the number 32. I have been waiting my whole life to be 32 years old and today is the day!!! 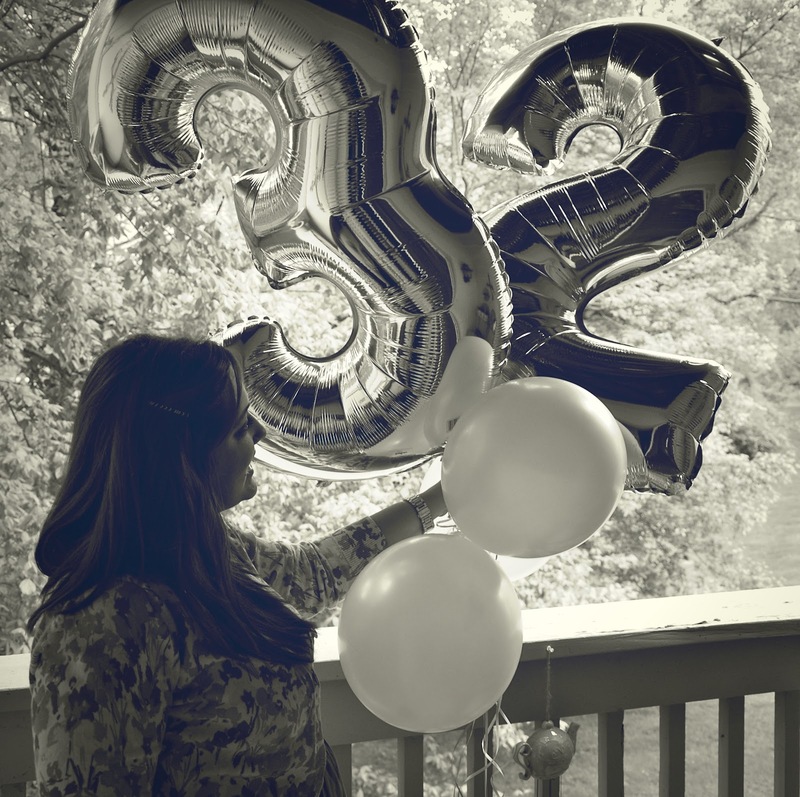 Before Amelia came, we had huge plans for my 32nd birthday. We had a very nice hotel booked in Chicago for a week. We had all kinds of awesomeness planned. I wanted these rings for my birthday, a 3 and a 2. Adam had been saving his allowance for awhile to get them. She is the best gift I could have ever received for my birthday. No pretty rings, no fancy trip. It's insane how much I had hyped up this day in my mind over the years and all I wanted to do was stare at this little baby girl all day long!! * waking up to Adam putting Amelia in bed with me so I could wake up to her. * I got to go to my sister's sonogram today!! It was the 3D one and Jack is already so adorable!! * I took Amelia to work today to meet my friends and when the 3rd and 5th graders (who were eating lunch in the cafeteria) saw me they started screaming at the top of their lungs and gave me a standing ovation. It was awesome. I haven't seen them in 5 weeks!! * an indoor picnic dinner with my loves. * the rest of my day was spent snuggling my baby girl. 32 is going to be amazing. I can already tell!!! Sending you lots of love and well wishes. PS. I can't wait to be introduced to Miss. Amelia! I just stumbled upon your blog today...this post is soo sweet! Happy Birthday-can't wait to read more! The part about the kids giving a standing ovation...MADE ME CRYYYY. I am beyond happy for you! I didn't realize you got your babyyyy! Gah my heart is just soaring for you. That is so amazing. a-m-a-z-i-n-g. (I found out someone adopted my son from Jamaica, after my 4 hard years of work since he turned 8 monhts old on my last visit to him) (But it's been a mercy-and-grace-filled process of letting go.) I am a little over 29 1/2, living in Australia as an Au Pair and making amazing friends, and not yet in love sooo maybe when I'm 32 I'll get a gift like you did?!?! haha Can't put a time on any of it, but it is just such a gift and so much to give praise and thanks for right!